Class 8 student Tilak Mehta is leveraging the dabbawala association to aid Mumbai people to courier their important ‘Papers N Parcels’ all over the city for daily delivery at most affordable prices. 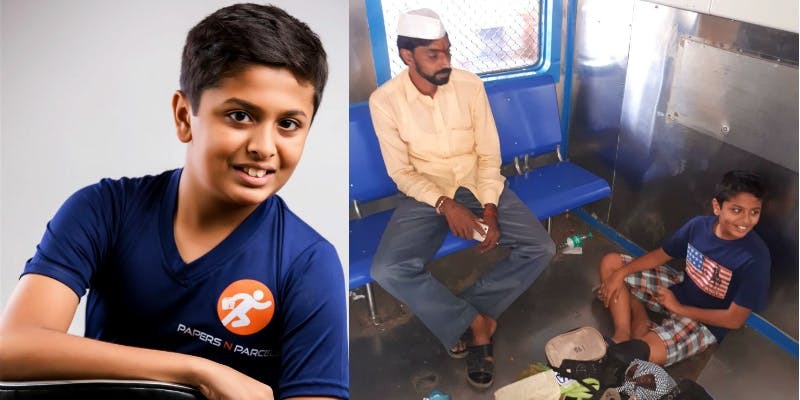 The 13-year-old boy has rolled out the fastest courier service startup in the city of Mumbai that delivers ‘Papers N Parcels’ in a period of 4 to 8 hours. Also dubbed as a young entrepreneur, Tilak is an 8th standard boy who studies at Garodia International School in Mumbai. What made him think was an episode where he forgot a few books at his uncle’s house and thought there was a service, which would assist him to get those important things couriered to his place without any delay. “I was thinking about this for days and when I saw a dabbawala in my building, the idea for Papers N Parcel struck. I always marvelled at the swiftness and the efficiency of the dabbawala’s food delivery network, and I wondered if the network could be used to allow deliveries of even non-food items,” he said. “It didn’t matter if I was young and still in school. I took it up as a problem that was waiting and wanting to be solved, and there was no turning back,” he added. His dad, Vishal Mehta, who happens to be a well-known player in the logistics business, aided “courier” this thought from paper to market. Tilak’s pursuit of app-iness took him to access systems, but finally, he launched the most trusted delivery service in the city – the dabbawalas. With the introduction of the Papers N Parcels mobile application, he is not only leveraging their dependable system but is also “Uberising” the group by offering door-to-door courier service at a click. Papers N Parcels depends upon the transformational structure of the dabbawalas, where the white group has Android phones with the PNP app. The dabbawalas, in return, get fixed salaries from Papers N Parcels. Thus far, 300 dabbawalas have been working among Mumbai’s 5000-strong network. “By using the existing dabbawala network, we give world-class service at the best prices. You can also make multiple scheduled deliveries and choose from three convenient time slots,” Tilak stated. “During our beta testing phase, we have successfully carried out many transactions. We have thousands of retail and corporate giants as our customers, and see a daily volume of close to 1,000 to 1,200 requests, which we expect to increase to 2,000-5,000 in next six months,” Tilak revealed.